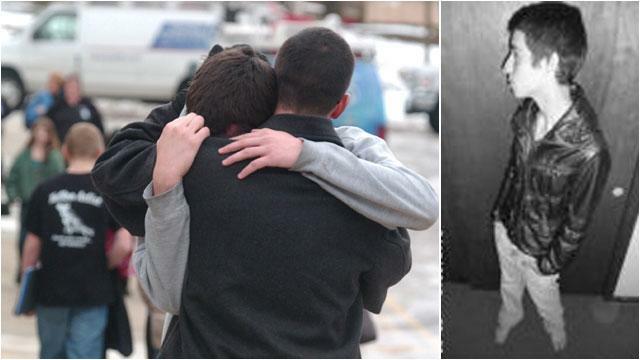 The toll in the Chardon High School shooting grew today as a shooting victim was proclaimed to be brain dead. Another victim, identified by MetroHealth Hospital as Daniel Parmertor died from the wounds on Monday, hours after being shot. As the Ohio town coped with the carnage, the focus turned to alleged shooter T.J. Lane who a fellow student and witness identified as the person who shot up his school cafeteria Monday. In addition to King and Parmertor, three other students remain hospitalized. Lane, a juvenile, is expected to appear in court this afternoon. Nate Mueller, a student who was sitting with three friends who were shot, described Lane to ABC News as "a quiet kid. Freshman year he got into a 'goth' phase and didn't talk to that many people anymore. He never egged anybody on. He just went about his business." Some classmates described Lane as an outcast who'd been bullied. In late December, he posted a poem on his Facebook page that read: "He longed for only one thing, the world to bow at his feet," and ended ominously: "Die, all of you." But other classmates say Lane had friends and wasn't bullied. "He had friends. He was quiet," Chardon High School student Tyler Lillash said. "From what I heard he posted some pictures on Twitter of, like, some dude holding guns. But other than that I don't really know. I don't think he was bullied, though." Lillash was a good friend of Parmertor, one of the teens who died, and said he "started crying uncontrollably" when he heard the news of his friend's death. Another student, Lexi Joy, passed Lane in the hallway right before the shooting, saying they exchanged a smile and a nod, like usual. "He didn't seem any different. He seemed just like he'd be on a normal day," Joy said. "He didn't show any expression on his face. He was just TJ." Lane's family life had been disrupted by divorce and violence, ABC News affiliate WEWS reported. His parents divorced in 2002, and his father later served time in jail on assault and other charges, according to the station. Attorney Robert N. Farinacci is representing Lane released a statement on behalf of the family Monday night, according to WEWS, calling the incident "something that could never have been predicted." "The family is devastated by this recent event. They want to express their most heartfelt and sincere condolences to the family of the young man who passed and their continuing prayers are with all those who were injured," Farinacci wrote. "TJ's family has asked for some privacy while they try to understand how such a tragedy could have occurred and while they mourn this terrible loss for their community." The shooter was chased out of the building by a teacher and was arrested half a mile away near his car. The suspect is in custody at Geauga County Safety Center. The attack left "friends laying all over the place" in puddles of blood, Mueller said. Classes were canceled for all schools in the district today.